A refreshing alternative to the relic thing, the folks at San Dimas Guitar Company will build you a hotrod S-type guitar with top quality hardware and a huge selection of graphic finishes, which even includes working with you on your own graphic creations. The graphic for this featured model "Native American Warrior Shield", is also a tattoo of the customer. Ever thought about having your favorite tattoo put on your guitar in addition to one of your own body parts? If you're into ink, and also play guitar, this is a great way to extend your identity. Much cooler than naming all your kids "George". An in-house design called Bomber Chick features a classic WWII aircraft finish with rivet panels from front to back and a pinup babe whose stockings you're sure to be a fool for, I believe. 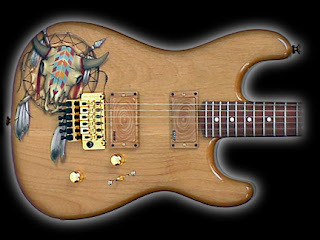 San Dimas also employs PLEK technology, a computer controlled machine which scans and dresses a guitar's frets while the guitar is fully strung and tuned, for optimum intonation. 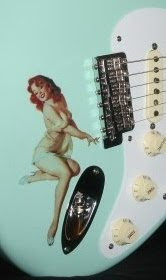 So, the folks at San Dimas Guitar Company are about Retro, State-of-the-Art and filling the customer's needs-- all in one. Check 'em out!